Legal Schnauzer: Alabama appellate court affirms most of the convictions against former Speaker Mike Hubbard, but the question remains: What took them so long? Nice to see that Hubby is one step closer to being in prison, where he belongs. There's no valid reason for an appeal to take this long. Something had to be going on behind the curtain. Good news, Hubby! Orange is the new black. You've got some interesting theories there, LS. Not sure if they are on target, but something certainly was going on. Another example of Alabama courts being a quagmire, and the judges involved don't even seem to care how it looks. It does seem something happened in recent days to cause them to care. Hubbard named one of his kids after Bob Riley. Hey Mikey, how is that working out for ya? Bill Baxley was shocked, but someone handed him a flask of Johnny Walker Red, and Bill was perfectly fine again. Calmed his nerves real fast. Since when is it the court's duty to tell the legislature what to do about the ethics law? That part of the ruling really pisses me off. That's not the court's business. "In its ruling in which it upheld 11 of the 12 convictions against former House Speaker Mike Hubbard, the Court of Criminal Appeals was critical of the state’s ethics laws, and Judge Samuel Welch encouraged the Legislature to clear up some of the confusion over definitions. Welch was particularly concerned over the definition of a “principal,” or the person or entity that hires a lobbyist. "Ever since Hubbard’s conviction, lawmakers who were used to getting free suits, swanky dinners and monthly stipends from big businesses around the state realized that they had — in a moment of overzealous morality — put a stop to it all. Even worse, they had created broad definitions that could be used to actually punish them for doing shady things. "And by shady, I mean this: Hubbard got a consulting contract with Alabama Pharmaceutical Cooperative Inc. (APCI) that paid him $5,000 per month, and then he went along with a plan to insert language into the state’s general fund budget that would have given APCI a monopoly. "Welch and his pals on the Appeals Court overturned Hubbard’s conviction on that count, because — you’ll love this — he wasn’t an employee of APCI." "People know what’s happening here. They know that it’s possible to be an honest politician. They know that dozens of elected officials do it every single day. And they see through this absurd hand-wringing over specific definitions and phony confusion over legal specifics. "To the Alabama political class, Mike Hubbard’s conviction was a sign of unintended consequences and bad laws. "To regular Alabamians, it was a good start." I think your theories are far-fetched, Schnauzer. As I recall, Hubbard cackled and crowed when Don Siegelman was headed for prison. Hubbard doesn't seem to find the idea so amusing now. Kyle Whitmire of al.com wants to know why Mike Hubbard still isn't in prison. I want to know the same thing. Every time I think about Mike Hubbard possibly spilling his guts on Bob and Rob Riley, a huge smile comes across my face -- and I can't wipe it off. "Astonishingly, the Court of Criminal Appeals was able to uphold 11 counts of former Speaker Mike Hubbard’s 12 count conviction while opening a door for the state’s ethics act to be gutted by the Legislature to make sure Hubbard is the last public official held criminally liable under existing laws. 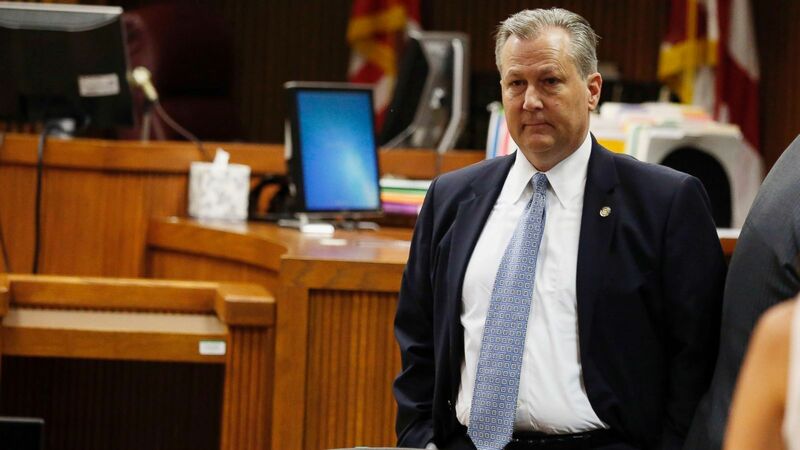 "That is the hard truth of what is found in the opinion handed down by the Court of Criminal Appeals nearly two years after Hubbard’s conviction and four years after his indictment. "Justice Samuel Welch wrote the opinion and confirmed by Judges J. Elizabeth Kellum, Liles C. Burke and J. Michael Joiner is a politically-motivated legal slight-of-hand that at once upholds 11 counts of Hubbard’s conviction while creating doubt on who is a principal, what constitutes a conflict of interest while making it legal for a lawmaker to vote on legislation while getting paid to do so by an outside interest. "Now it is clear why it took Welch, Kellum, Burke and Joiner nearly two years to render a verdict in Hubbard’s appeal; they needed time to get past the primary election season to make sure there would be no political blow-back on Republican elites and officeholders. "Welch, Kellum, Burke and Joiner show just how far they were willing to go to do the devil’s bidding in their torturous augment to reverse count 5." "During the 2013 legislative session, Hubbard had language inserted in the Medicaid portion of the General Fund Budget that would have effectively given APCI a monopoly over the State’s Medicaid prescription contracts. APCI paid Hubbard $5,000.00 a month for “consulting,” while serving as Speaker of the House. "Hubbard voted for the General Fund Budget that contained the monopoly for APCI with full knowledge he was doing something wrong. "In their reversal, Welch, Kellum, Burke and Joiner mysteriously found that the ethics statute failed to define an employee clearly. "The judges found that since Hubbard derived less than 50 percent of his income from APCI, he must not be an employee. "Of course, Welch, Kellum, Burke and Joiner also failed to realize most of Hubbard’s income was from contracting work the jury found illegal." Yov've been providing evidence for years that Alabama courts are corrupt, and it looks like some of your media colleagues are finally starting to get the point. It's ironic that Mike Joiner is one of the four judges on the Hubbard panel. Joiner used to be a crooked circuit judge in Shelby County and was one of the first judges to cheat us -- on behalf of corrupt lawyer Bill Swatek -- in the case involving our criminally inclined neighbor. One of Robert Bentley's first acts as governor was to appoint Joiner to the Court of Criminal Appeals, mainly because they grew up together in the Columbiana area. I've been exposing Joiner for 11 years, so his actions on the Hubbard panel should not surprise anyone. The case had to be dismissed on so many grounds--eight to 10, at least--that I filed three motions for summary judgment (MSJ), each raising distinct issues of fact and law. On the first MSJ, McGarity filed a response, but he filed no timely evidence as required by law. He did file an affidavit--which did not dispute the fundamental facts and law at hand--but it was 10 days late and had to be stricken as a matter of law. Joiner denied summary judgment anyway. On the second and third MSJs, McGarity filed no response at all--no affidavit, no evidence, nothing. That meant the evidence I filed, which was different from the evidence in the first MSJ, was uncontroverted. In such circumstances, Alabama law is clear: Summary judgment must be granted and the case dismissed. In fact, the law in all jurisdictions is clear: Such an MSJ simply cannot be denied, and it's a "nondiscretionary" ruling. It's about as clear and universal as law can get, like "three strikes and you're out" in baseball. But Joiner could not get it right, and he denied all three MSJs. "When a party opposing a properly supported motion for summary judgment offers no evidence to contradict that presented by the movant, trial court MUST consider the movant's evidence uncontroverted, with no genuine issue of material fact existing." Voyager Guar. Ins. Co., Inc. v. Brown 631 So. 2d 848 (Ala., 1993). It can't get much more clear than that. For those who think I'm a misguided, loony conspiracy theorist, I invite you to check the public record in Mike McGarity v. Roger Shuler, CV 00-124, and then read Voyager Guar. Ins. Co. v. Brown. That will show you that J. Michael Joiner is, in fact, corrupt--and it's not a matter of anyone's opinion. "Hubbard’s cronies understand he was breaking the law just minutes before he cast the vote in 2013, and warned him not to do it. "Hubbard’s chief of staff, Josh Blades, lobbyists John Ross and Dax Swatek all testified they cautioned Hubbard not to vote for the bill. Blades swore under oath that Hubbard was aware at the time of the problems he faced but voted on the bill anyway, later saying he never thought it would pass. "As a result of the Court of Criminal Appeals’ actions, a lawmaker may now be paid by an outside interest to vote on legislation that benefits that group and not be in violation of the ethics act. "Welch, Kellum, Burke and Joiner should be ashamed." Why did it take so long? My guess, they were making a deal somewhere so that Trump might pardon him. Lets just wait and see what happens. If he is pardoned it will be after the mid terms. there may have been something Trump wanted in return which may have something to do with his wanting to dump Sessions. Perhaps a deal was made and now all will be happy. except for Hubbard. I may be wrong but I don't think Trump can pardon anyone convicted of a state crime. He can only pardon federal crimes. LS, correct me if I am wrong. Yes, I'm pretty sure you are right. Hubbard was convicted in state court, so I don't think Trump would have the authority to pardon him. Seems pretty clear that politics has been affecting the court's actions on the Hubbard case, but I don't think we can blame Trump on this one. I think it's more of a Riley Machine action, along maybe with Bill Canary, etc. The closest thing to Trump might be possible involvement from Jeff Sessions, and it looks like Sessions is almost out the door in Trump World. Hubbard probably has an enormous amount of dirt on political, legal, and corporate types in Alabama. I think concern about that is causing his court case to be handled in a peculiar manner. @LS 12:06 PM -- Trump has no authority in state courts. That's one of the reasons the Special Council has returned a number of cases to the SDNY (Southern District of NY) so that Trump can't engage in further obstruction of justice (by dangling pardons in front of folks willing to obscure the bigger offense of criminal conspiracy). Captain Marshall has pretty much confirmed that Hubbard has all the dirt you mention, and that the in-crowd will go to great lengths to see that it stays private. Thanks for your insights. To what lengths do you think the in-crowd can go to keep Hubbard's dirt private? I STAND corrected, The president may not pardon for State crimes. Ought to have remembered. Thank you for pointing it out. so it must be something else, but some where some one is doing a deal regarding this, hence the time involved. @12:43 here: Perhaps that's a question you should pose to Captain Marshall of the Eliza Battle. Ah, good idea. We're due for a communique from the good ship EB.